How do you start a capsule wardrobe? How do you create Grab and Go looks when you are in a hurry? What do you wear when you are staying home? These are some of the questions women often ask me. In this post, I show you what I took on my most recent vacation and a few of the outfits I created with just these few pieces. There are many more possibilities! This mini wardrobe is an excellent example of my capsule wardrobe for daily life. 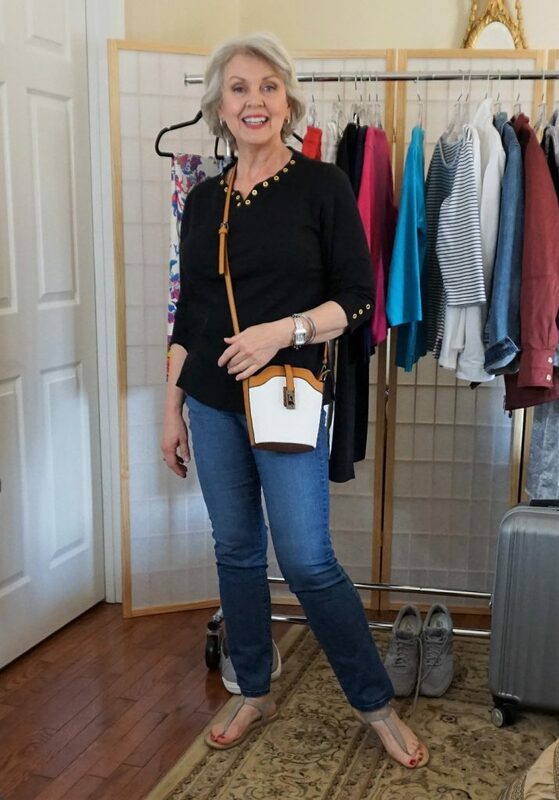 I am semi-retired now, so I spend a lot of time working from home, but still want to look nice for myself even if no one is going to see me but the UPS person or maybe the mail carrier. There are seven tops, four pairs of pants, and three jackets. The accessories included two scarves, three small handbags, a hat, and three pairs of shoes, socks (for those long walks in the lace-up sneakers), two pairs of pajamas, bras, and undies for each day. All of the items fit into the two bags shown in the video at the bottom of this post. The Levi´s Original Trucker Jacket is from Dillard’s. The fuchsia tee is from Chico’s. The white jeans are by Everlane. The Triple Decker silver platform sneakers are by Keds from last year, but I found them on Amazon here. 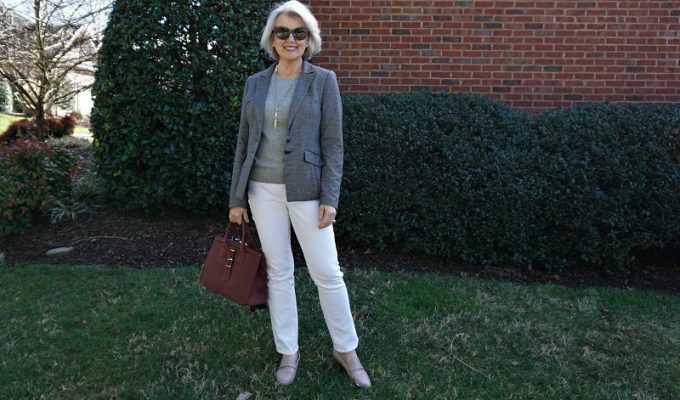 The crossbody bag is by Patricia Nash from Dillard’s. 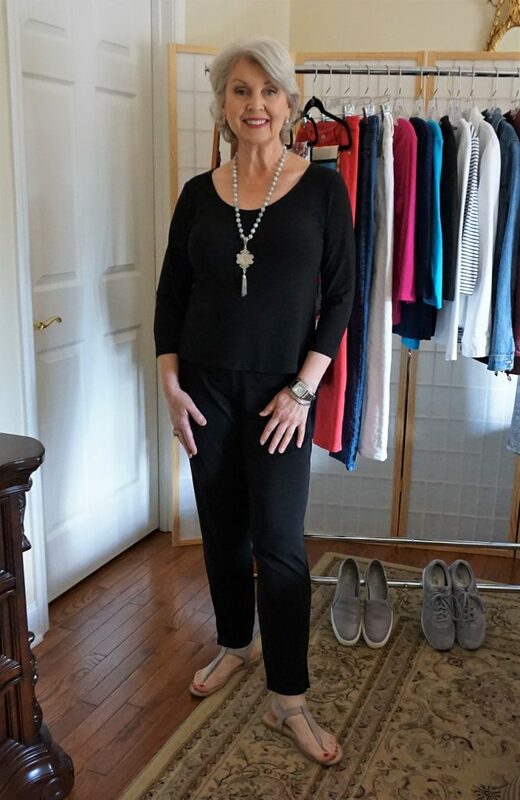 I wore the black ankle split pants and three-quarter sleeve top from my shopping site here to travel because this is the most comfortable clothing I own. 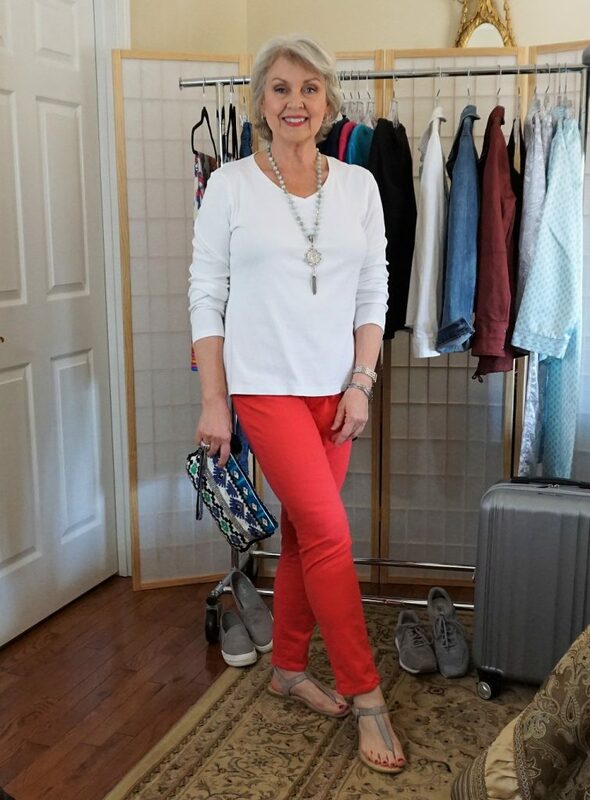 In this photo and the video below, I am wearing the medium size top and the small pants with the necklace and the sandals mentioned above. The striped tee goes well with the Malibu Punch jeans. Both are from Chico’s. The hat is by Betmar from Belk here. The small crossbody bag has no name. I bought it from the Little Shop inside The Martha in Abingdon, Va. 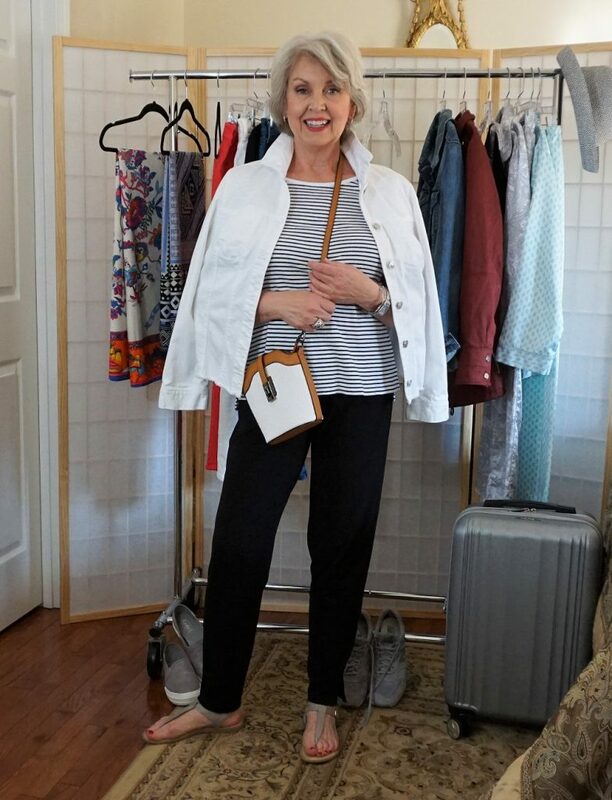 The same striped tee looks great with jeans and the white jacket from Chico’s. The more casual Patricia Nash bag complements the New Balance walking shoes. I was on the beach a few times as the sun was coming up so I was very glad I brought this heavier utility style jacket from White House|Black Market. The air was very cold in the mornings and after the sun went down. This scarf was another layer to keep me warm as needed. You can find it here on my shopping site. The tee is from Cali & York a few years ago. Those are the black ankle pants again worn with the Børn sandals and the cute little crossbody bag. The navy tee also looked great with the Malibu Punch jeans and the same scarf! Here is another tee with brass grommets from Cali & York a couple of years ago. The jeans are the Sheri Slim style from NYDJ. The same black tee works with all the pants I took. 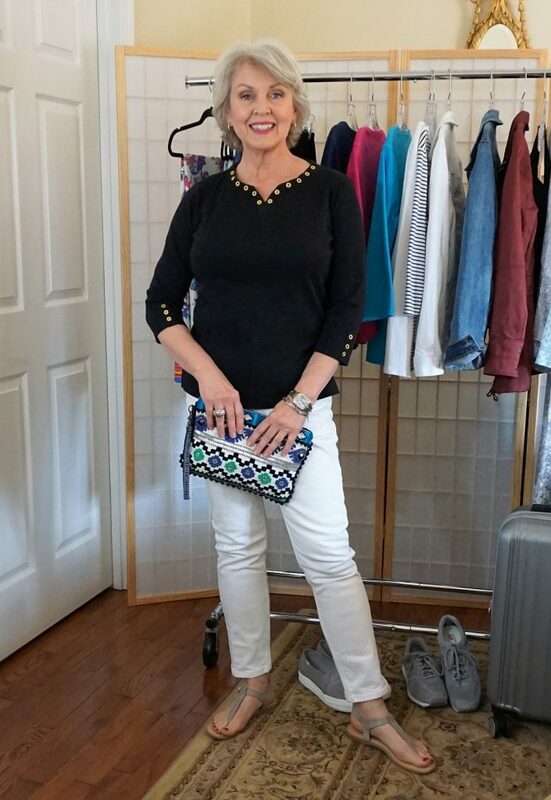 The black pants from my shopping site with the striped tee and the white jacket from Chico’s made for a comfortable, smart look for shopping one morning. 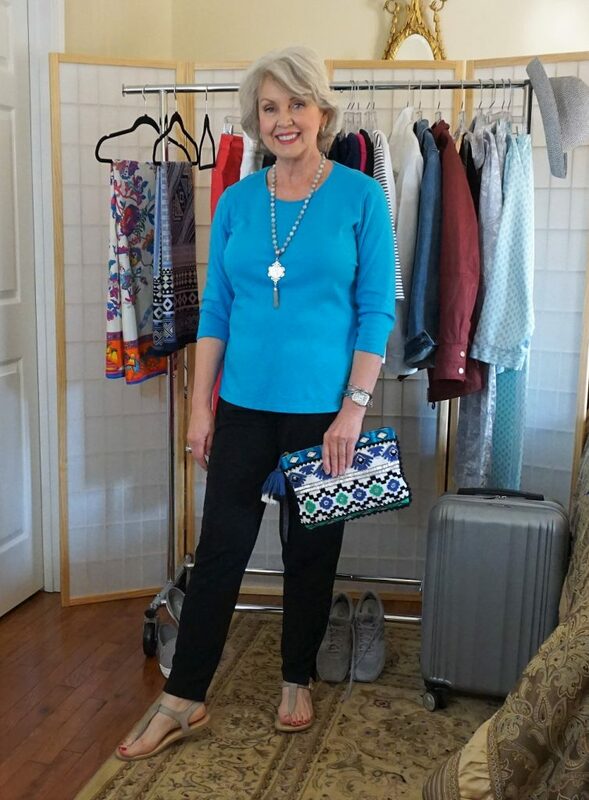 The black pants from my site and the turquoise tee from Cali & York along with the bright accessories made for a good look to wear out to lunch. All of the restaurants were very casual. You can’t go wrong with navy and white! That is another tee from Cali & York a few years ago. The Tankee bra is from Shapeez.com. The pajamas are by Miss Elaine from Belk. Have a fabulous weekend! 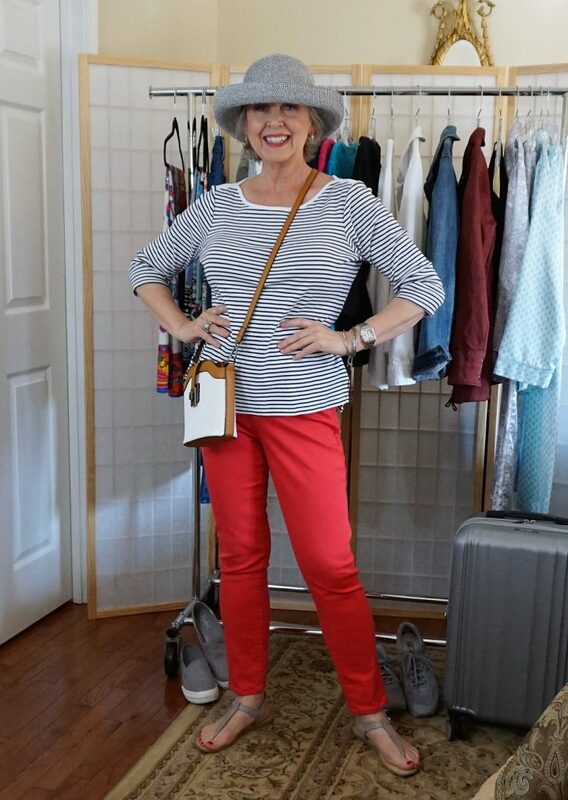 Susan, you are my go-to fashion guru! I have never been one to follow fads but have always loved understated sophisticated fashion. You have hit the nail on the head with every outfit! I am so happy I found your site! You are my fashion soul sister! Thank you for this sweet comment, Ellie! You even make casual look good. All of these looks are understated, yet so polished! This is a wonderful primer on how to be casual, yet smart. Well done! Plan to duplicate your packing list for an upcoming 8 day trip – I have similar items in my closet!!! Great demonstration and powerful with pictures showing many from few. Lots of combinations and great results! Thanks. That color from Chicos is fabulous on you..
Fabulous video! Thank you Susan for breaking things down for us. I traveled recently and used your methods to feel great and have many possibilities for my whole trip. The better I keep my clothes edited based on how well they fit my body and personality along with how well the items coordinate with each other, the happier I am. Your teachings have helped me enjoy fashion in a practical and fun manner! Thank you for the feedback and your comments Naomi. I always enjoy reading what you have to say! I love how you make these casual clothes look so polished. I am a casual person at heart, but don’t like to be too casual as that feels scruffy. I need to pay close attention to this post. It’s exactly what I need. I’m right now packing for a city break, this has been so timely, many thanks. Susan, I’ve followed your blog for years but have never felt the need to comment until now. I’m loving the changes you’re making to your style! Your new haircut is perfect as it frames your face and, in my opinion, gives you a most youthful appearance. 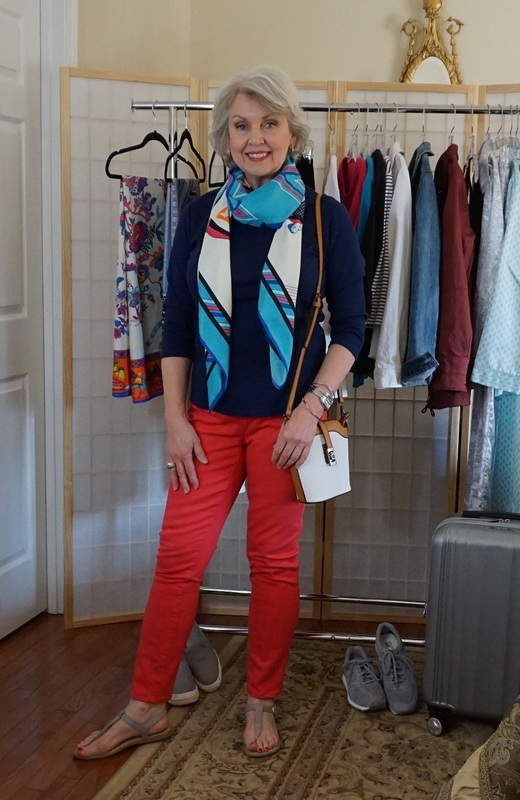 Bringing color into your wardrobe has put a glow to your skin which I hadn’t noticed before and is inspiring me to get out there and bring more color into my wardrobe. We grey hair gals can tend to gravitate to grey and navy but in reality look great with strong, saturated colors. Keep up your awesome work – it’s most appreciated! And now, I’m off to shop. Perfect timing as I’m planning my vacation wardrobe. I also like to look pulled together and stylish when I’m home. It just makes me feel so much better and I can accomplish so much more! Thank you for keeping me styling, classy and on trend. Hi Susan, I enjoyed your vacation wardrobe video. I have noticed for several weeks, you do not look yourself – I know some of that is the change of hair style, but your eyes look very weak, and you look tired. I know you should never mention when a person does not look on top of their game; I mention it only because of concern for your health. I hope you are much more well than you appear. I am very healthy, just getting older. Part of the issue may also be that I genuinely dislike winter and it just won’t go away. If I alternate pants after a few hours, rather than wearing them all day, they hold out a bit better. I hang them from the hemline of the leg rather than the waist after wearing them. The weight of the waistband helps to straighten them out somewhat. (When I am not on vacation, I only wear pants once before washing them.) I buy jeans too tight if they have any stretch at all because I know that within an hour they will start to bag. The Betmar hat I showed has a little ribbon sewn into the band on the inside so that it can be tightened to adjust the size of the hat. I do have some hats that are sized larger than others. Maybe if you can try on a few different ones, you will find one that fits you. Susan you are amazing! Love all the travel outfits! Congratulations on slowing down with work and increasing your travel time. I enjoy your teachable tidbits for dressing appropriately. Please take extra care of yourself, you look sad in your eyes. Know you are appreciated by your blog fans. Is that one of your scarves hanging on the hanger on the end of the rack? It is! I failed to mention the source. It is here. Thanks!! I just ordered in the silk satin, have been looking at that since you first posted pics from your trip. Will go with several pairs of pants I have – including the malibu punch pants from Chicos. Just watched the video – you are just too cute and sweet!!! Thanks for taking you time to put this together! Hi – love your blog! Where is the blue cotton scarf from that you showed at the beginning, but didn’t take? I looked for it on your shopping site and didn’t see it. The new scarf I showed in the video is here. LOL Susan – what a gracious and funny reply! Loved every one of these outfits! You are such an inspiration! I save almost every one of your photos to a “style” album on my iPad. Thank you so much for all the time you take to help us look our best. I believe someone told you your style modifications make you look older — whatever that means. I think you are looking fantastic!! Your new approach is giving me lots of ideas. Wonderful video Susan. You’ve inspired me to add more color to my wardrobe. @Rebecca Winters, I have the same figure concern – waist a bit wider in proportion to hips and rear and thighs. I almost always have jeans tailored. I buy to fit my waist and alter the legs in thigh area, which pulls in the rear end area too. I have even done this myself on less expensive pants by trying them on inside out and marking with pins on the outside seam below pockets to the knees. I also avoid jeans with too much stretch, as they will slide down with no hips to hold them up! A heartfelt thank you, Susan. I have followed you for 3 years now and love your practical style. Thanks to you, you have taught me how to purge the “frump” from my closet and enjoy fashion again. Thank you. Yes, Mr. Mickey gave up a couple of hours of his evening to help me with this post. I try to always keep the crossbody bag on the front of my hip rather than letting it slip to the back. Thanks Susan for all the ideas, they were helpful. Thank you Susan. This post is so helpful and fun. Susan, this is just what I needed to see. Your ideas are well-thought out, practical, and comfortable. I am a retired teacher, so I did a silent high five when I saw the more casual combinations. 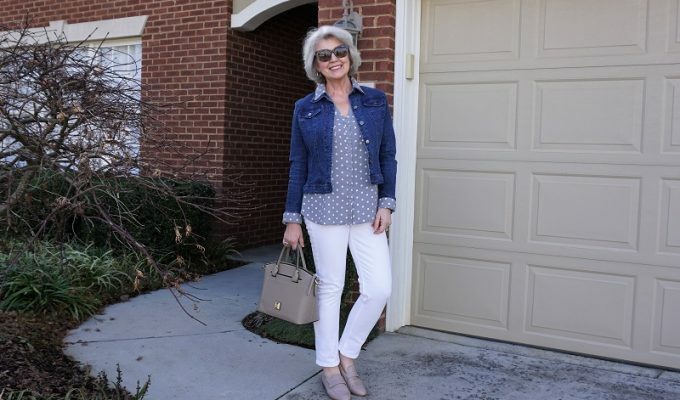 (Thank you for including a tee from Kohl’s, as I have some Kohls Cash to spend!) Thank you! Susan, Thank you! Thank you!! I have found your style blog is my ” go to” for this wonderful season of life! 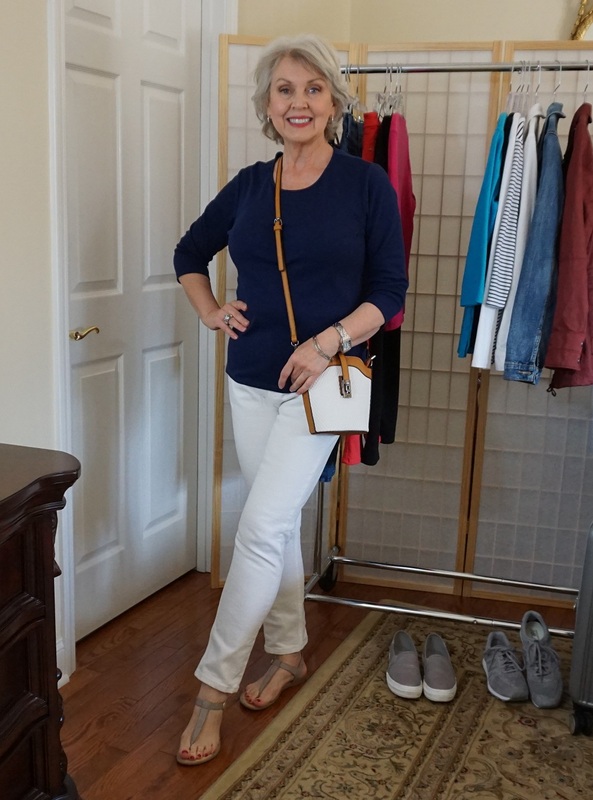 I am retired and lead a fairly casual lifestyle, but I still want to look put together and classy! Your packing recaps are invaluable! Please continue to teach us! I always forget about navy blue, but your comment, “You can never go wrong with navy and white,” and the photo reminded me how sharp it can look. Those Bjorn sandals are the perfect neutral sandal to wear with so many different outfits, but you have to have pretty feet like yours to wear them! I found a classic style made by Bjorn that came in gold, white and black. I liked them so much that I bought several of each, so that when a pair begins to show wear, there’s a replacement. Do you ever do that? I do! When I find something that I enjoy wearing, is of good quality and goes well with other items I have, I may buy one or more in every color that works for me. I want to thank you for this blog. I used to be able to pack for trips but the last few years have struggled with how to pack and have what I need. I either end up with the wrong things, too much or not enough. I took some notes to help me pack in an organized fashion. I am also going to bookmark this blog to refer to. Thank you! I’m glad to see you taking more time for yourself. Life is short and getting shorter. It’s time to savor every single moment. 🙂 We have so much to be grateful for. The marinière is the striped top I showed. Of course! I was asleep on that one. Had your clutch in mind on that one. Thanks. Really great tips and advice. Again, fantastic outfits. I always tend to overpack. Truly enjoy your blog and timely tips. I did not see a mention of the lovely orange and white scarf. Is it one of yours? It is the Tree of Life scarf in silk. It is sold out at the moment but more are on the way. I love all of your outfits and you have great taste. I always admire scarves on other people but I just feel goofy in them myself. Any advice on how to tie them and what size works best? Thanks! Try just draping them around your neck under a jacket. I like them wrapped simply or draped rather than fussy ties. would donate it to a worthy cause immediately! Your video is very informative! 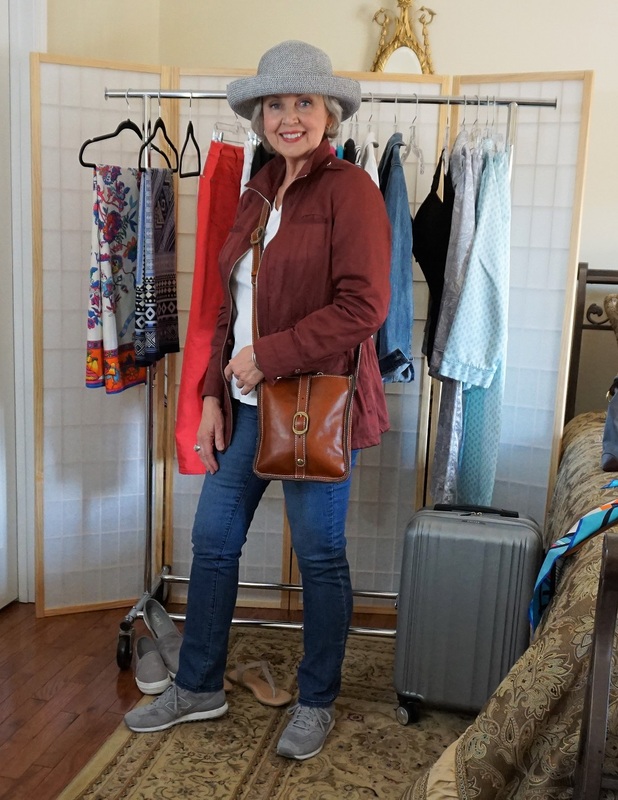 I am going on a Viking River Cruise and while the Florida vacation isn’t the same weather, the ideas of making 50 different outfits helped me rethink the number of things I can take. I tend to take too many things and stuff my suitcase full. However, some good advice a friend gave me and made me laugh at the same time: Take half as many clothes and twice as much money!! Again, thanks and may God richly bless you…. P.S. I have worked in Boutique at Steinmart for nearly 10 years and when you mention Steinmart, my face lights up.. I hope you have a splendid time on your cruise! Steinmart Boutique always has something wearable and beautiful. The size large should fit you well. The measurements for each size are included on each description page but you need to scroll down to see it. There wasn’t enough room at the top of the page. I have more of those pants and tops on order. I hope they will be here by Friday. Hi Susan – first let me say I love your page. I look forward to your posts. A while ago you did a post about the correct pant length with various heel heights. Would you please give me the name of that post, so I can pull it up again? I am also petite and am trying to decide on the appropriate length so that I can wear some of my pants with flats or heels. Is that possible? I have actually bought the same pair of pants twice to hem at different lengths. That gets expensive! 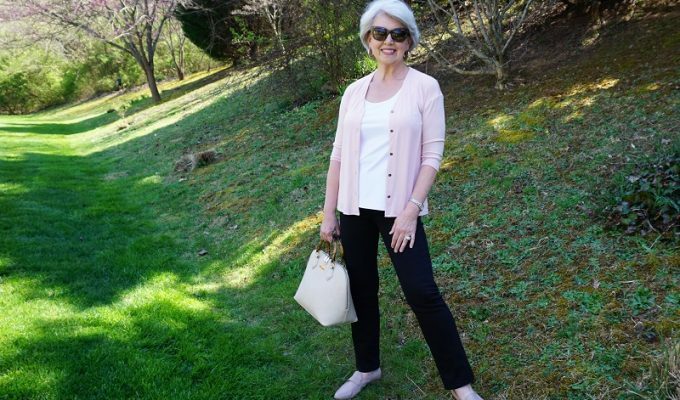 I don’t recall a post about wearing a certain heel height with specific pants, but I have posted about where the hem of certain styles of pants should end. Capri and shorts should end at the most slender part of the leg. Ankle pants should end at the most slender part of the ankle, usually about two inches above the ankle bone. In general, the wider the pant leg, the longer the pant should be. Boot cuts, flares, and straight leg pants should touch the top of the foot without bunching or puddling. Palazzo pants (and evening gowns) should end about a quarter inch off the floor and cover the foot. Once again Thank You soooo much for your wonderful video! This one is great it shows warmer weather and casual clothing you look amazing! Thank you for all that you do ! I love that you tell us where everything came from it makes it so much easier. I still have trouble finding anything I am a size 0 /2 and I am about 5ft almost 4 so sometimes I am Petite and sometimes I am not. Often when you go into Petite the colors are limited. I have fallen on black and I am very tired of the black so I am hopping to branch out soon and add navy and white. I Love your look and your attitude about life ! You are AMAZING!!!! One of the best I’ve viewed….very doable and each outfit had a well put together look. You made it look simple…haha. Love to watch ur videos. U give excellent ideas for how to diversify the uses of one same clothing item. You are a classy, beautiful and very smart lady. Thank you for your ideas and your hard work. 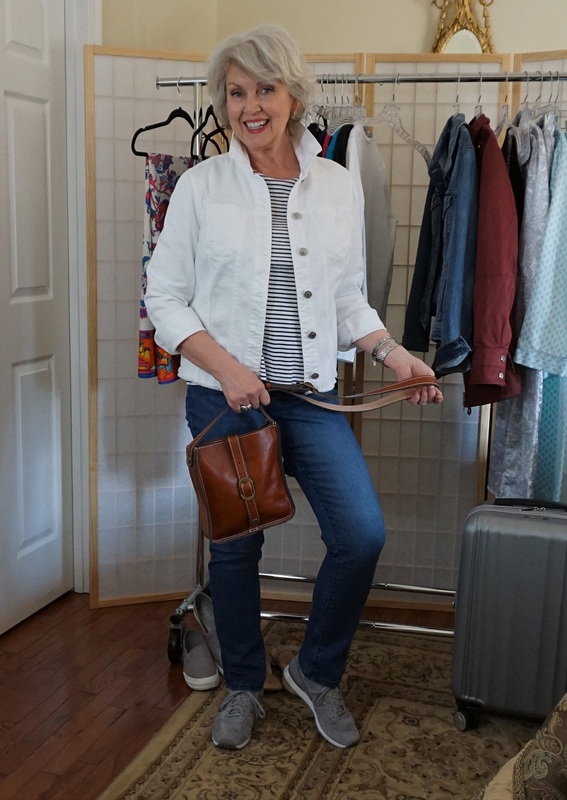 So happy to see this post on packing!!! I will be trying to replicate it for an upcoming 8 day trip. Thanks! Thank you so much for your blog. I am so grateful for the guidance you offer women in their sixties. We STILL CARE and that’s a good thing! You have a great sense of style without trying to be something you’re not–that being–trying to look ridiculously young as some others do. You know how to accentuate the positive, stay current and exude confidence in your manner of dress…you are a very classy lady. You are so down-to-earth in your clothing/accessory choices–price-wise, too. I always enjoy learning from you. There’s not a lot out there that elevates style for maturing women and you help bring that to the forefront making us feel like we can still count. Thank you so much for this lovely comment. You have made my day! I am currently planning my wardrobe for a 17 day trip to France. Your post is the most helpful one I’ve found. Merci Beaucoup!!! I too am a Chico’s shopper (not affiliated with them in any way) and I’m wondering if you are aware of their new website ChicosOffTheTack.com. This is their outlet and has only been online for a few months. I recently bought a wonderful white denim jacket there for about $55. Classic style, and no funky hem like the one at the Chico’s boutiques. It has stretch and is incredibly comfortable. I think you’d love it! I grew up in a time and place where for everyday we wore our old, worn good clothes. As an adult and as times improved I started buying casual clothes for everyday— discount store jeans, inexpensive t shirts and sweatshirts, certainly utilitarian but not particualrly flattering or fun. Now retired I am looking for a new daily uniform that is a bit more elevated and yet allows me to attack tasks like housecleaning and gardening without worrying about ruining my $100 jeans and $50 t shirts that weren’t designed for hard labor. Must I resort to athleisure wear? Or are there other options? Do the Cali & York tees/tops run true to size? Do they wear well after multiple washings? Yes, these wear very well, but they are from a couple of years ago. The company is under new ownership now. I am looking forward to seeing the new lines they will be coming out with soon. What color are the Born sandals? Grey or taupe? Very interesting post and helpful. I absolutely love your small white and tan cross body bag but cannot find anything like it in the UK. Do you have any email contact for the shop that you bought it from please. I bought the last one they had. There is no company name or logo anywhere on it. It was very inexpensive. The shop is no longer a specialty boutique. It is just a little gift shop. Thanks for the pics . You answered all my questions & I too love to shop @ Dillars & my fav is Chico. I basically already have most of the pieces in your video & pictures in my closet; glad you were able to show me how to put them together. Great video and lots of lovely outfits for a vacation. What do wear in the evening to go out for dinner? Every holiday I go, I overpack! I am going to keep this video and have another look 3 months before I go on my next trip! 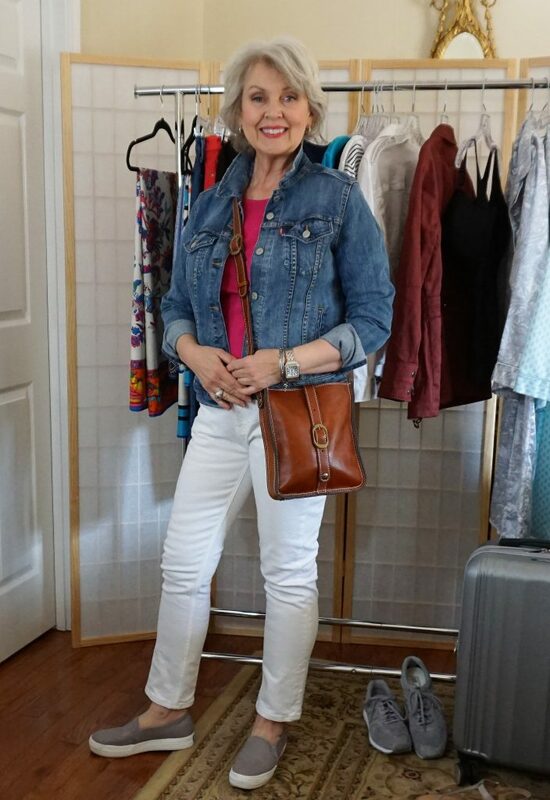 (I had 27 kilos last trip, although it was for 5 weeks and two different climates, I still had far too much) I live in Australia so your outfits are even perfect for me here in Spring and Autumn for everyday wear. Thanks again for such good practical advice. When I travel alone, I never go out to dinner. I’m usually in my room reading and relaxing after walking about ten miles during the day. I do eat a hearty breakfast and late lunch. If I did meet a friend for dinner, I would include some black or navy blue items from my site so that I could put together something appropriate for dinner time. Thank you for one of the easiest wardrobe suggestions I’ve come across. About to embark on a Scotland wales trip in August for six weeks and you’ve given me some amazing ideas. I now have you saved and it’ll become my go to site. Thank you you make things looks so easy, an stylish. dress up a bit more especially in major cities. For a European vacation, I would take black pants, white jeans, navy jeans, a blazer, a short rain jacket, (those plastic raincoats you buy on the street target you as a tourist). 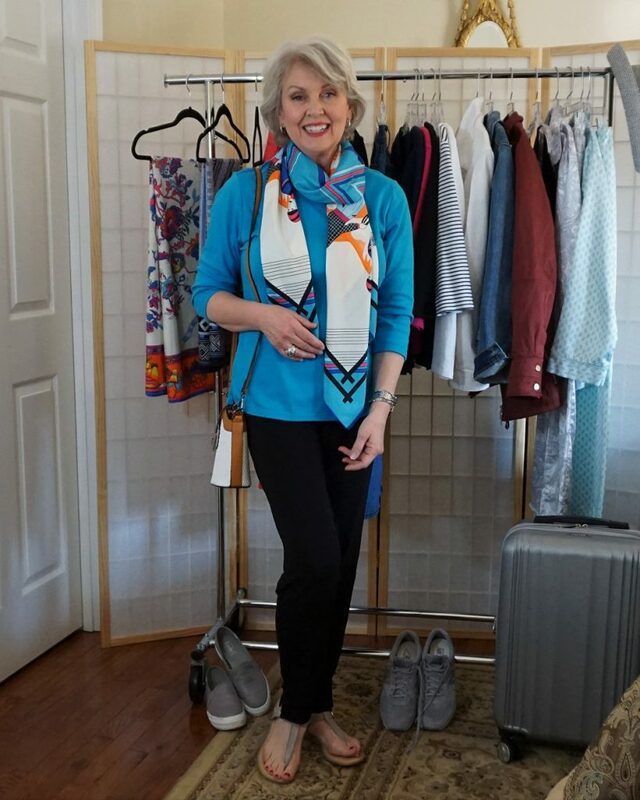 I would include a couple of tanks and silky blouses, a comfortable pair of shoes for lots of walking, four scarves, shoes and a clutch for evenings out and a nice leather bag for daytime. What a great video! I’m really tired of capsule wardrobes that monochromatic – wearing the same color everyday just makes me sad! As a (new) retiree, I can really appreciate the ageless look of all these pieces. Congratulations!